The woman's body was discovered in Watson Street, Glasgow, on Thursday morning. 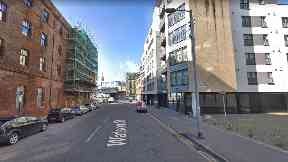 A homeless woman has been found dead in the Gallowgate area of Glasgow. Police confirmed they received a report of her death on Thursday morning. Her body was discovered in Watson Street. A Police Scotland spokeswoman said: "Around 11.40am on Thursday, police were made aware of the death of a woman in Watson Street. "A post-mortem will be carried out in due course." Following the discovery, nearby McKinnons Bar & Lounge paid tribute to the woman on Facebook. Staff posted that she was polite and well-mannered, and deserved to be remembered. They added: "She's has a family somewhere. And their worst fear has happened." Sarah McEwan responded: "No one should die on the street in this day and age, god bless her." Craig Melville added: "This is desperately sad to read and yet is becoming a far too often occurrence on our streets. "I hope that the police are able to trace the poor girl's family and let them bring her home to rest. "I can only hope that the young lady is now at peace."